Bottlenose dolphins are the most common members of the Delphinidae family. They derived their name from England, where they were named so due to the prolonged snout shape which resembles to that of olf-England bottles. 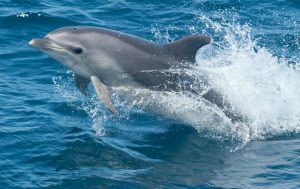 This is a genus of dolphins and have three species under them, common bottlenose dolphin, Indo-Pacific dolphin and Burrunan dolphin. This genus lives in groups that are called “pods”. They are also hybridized with other species of dolphins, such as Risso’s dolphin. The hybridizing occurs both artificially in captivity and naturally in their wild habitat. They are a fine example of the saying “beauty with brains”. Read below to find out further about this amazing species. Find out the physical structure of this beautiful and energy efficient marine mammal. Size: All the species under the genus of Bottlenose dolphin range between 6.6 and 13 ft in length. Male dolphins are usually a little longer than the females. Their sizes vary depending on the offshore and coastal ambiance as well as their geographical position. Color: They are grey colored. Some of these dolphins have light streaks on the sides of their bodies. Some may have spots on the bellies. Weight: Adults of this genus weighs between 150 and 300 kg. Males are heavier than the females. Head: The head is not separated from the body by neck. The rounded part on their forehead is known as “melon”, where fat is stored and it supports this marine mammal in its echolocation. Rostrum: They have a rounded head with a snout like projection that serves both as their nose and their mouth. This snout is known as “rostrum”, which is about 7 to 9 inches long. A lateral crease dissects the rostrum. Teeth: About 72 to 104 numbers of teeth fill the mouth of these dolphins. Each tooth measures approximately 1 cm. Eyes: Their eyes are placed on either side of their head, at each end of mouth line. An oily, mucus is secreted from the glands presented at the corners of the eyes. This cleans the eyes and also protect against infective organisms. Ears: These dolphins have very small, almost unnoticeable ear openings on either side of the head. 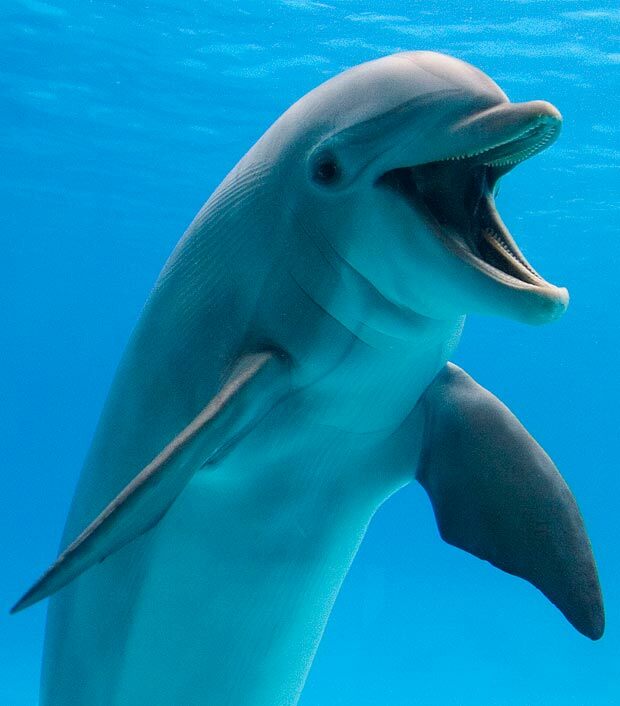 Body: Bottlenose dolphins have a sleek, fusiform and streamlined body. Skin: Their skin is very smooth, hairless and rubbery in texture. The skin flakes and gets peeled off naturally in every 2 hrs. Fins: Forelimbs of Bottlenose dolphins are known as pectoral flippers. They are curved backwards and are pointy towards the tip. These fins are about 30 to 50 cm long. The dorsal fin is positioned on the back, in the middle. It helps the dolphin to maintain its balance while swimming. The lobes of the tail fin are known as “flukes”. They are 60 cm approx from one end to the other. The Bottlenose dolphins are distributed round the globe. From Southern California to Chile, from Japan to Australia, Hawaiian Islands and Monterey form part of house of this genus in the Pacific Ocean. In the Atlantic Ocean, homeland of these dolphins stretch from Patagonia to Nova Scotia, from as far as Norway to the last tip of South Africa. Indo-Pacific species of Bottlenose dolphins are traced in parts of Indian Ocean, ranging from Indonesia, Australia, Red Sea, South Africa till the tropical and subtropical waters. This genus has also been observed in the Black Sea and Mediterranean Sea. Deviation in the water temperature and diet habit compels some of the species of this genus of dolphins to migrate elsewhere. The ones that dwell in higher altitudes tend to move southwards during winter months. Those species of Bottlenose dolphins that dwell in warmer waters tend less to migrate. Bottlenose dolphins find home in a vast range of waters. Coastal, open oceans, offshore and inshore are their homeland. 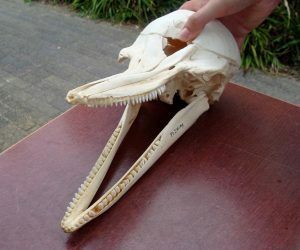 These dolphins feed on squids, mullets, shrimps, tunas, many varieties of small fishes, crustaceans, even the croaker and drum families. Their hunting habit is very flexible. Sometimes a group of these dolphins chase a large school of fishes to a corner and hunt on them. Sometimes they also hunt alone on individual fishes. These dolphins do not chew their prey. They pat their prey on the ocean surface until the prey dies and are torn into pieces, then swallow them. Let us study some of the interesting behavioral traits of the Bottlenose dolphins. They usually swim around in a group comprising of 2 to 15 dolphins. Their each dive lasts till 10 min on average. 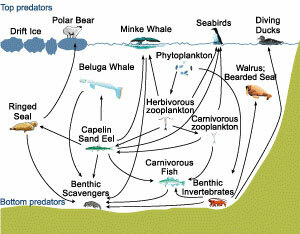 They migrate to other marine zones if scarcity of their food arises. 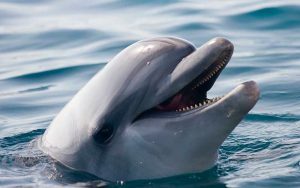 Earlier it was thought that these dolphins do not change the composition of their groups but recent researches show that they do change. The group size is directly proportional to the depth of the water level. The group composition depends on the gender, reproductive condition, age and origin history as well as social history of the dolphins. Adult male dolphins bond very strongly, even for as long as 20 years. Males and females bond for short time span. These marine mammals express rage and aggression by slapping their tails on the surface of water, jaw-clapping, biting and chasing the others. They also blow clouds of bubble from their blowholes to express anger. The Bottlenose dolphins are active both during day and night. They are very social in nature. Adult males mostly go out in small groups of 2 to 5 males, whereas adult females go out in groups that consist of up to 15 females. They have been observed to socialize politely with whales and other genus of dolphins. They are very intolerant and even aggressive towards sharks. 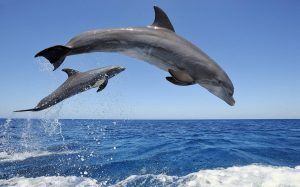 It is very important for the dolphins to make sounds under and on the surface level of water in order to locate prey, raise alert against predators and communicate. The signature whistle of each dolphin is different. Different dolphins can be identified by observing the measurement of their whistles on sonograms. Range of their signature whistle varies between 7 and 15 kHz. This signature whistle lasts for as short while as less than a second. 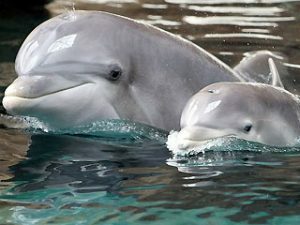 Mother dolphins call out their signature whistles to their calves after a few days from birth, which help them to identify their mothers from others. They develop this signature whistling call at the tender age of one month. Their calls resemble to that of moans, grunts, trills, cracking doors and even squeaks. They are capable of making these sounds even under water. Depending on the depth of water their sounds vary in wavelength, frequency and volume. Bottlenose dolphins possess the highest ration of brain to their body mass. They have been tested under experimental observation and have been found to recognize themselves in the mirror. This means they are self aware. They were further trained to respond yes or no with their head nods to simple questions. The dolphins scored 75% times of correct response to those questions. Research is still going on to find out the level of their intelligence. These dolphins imply echolocation strategy in locating their prey, foreseeing possible predators and even figuring out any arrival of new shapes in their habitat zone. They emit out a sound vibration and when the wavelength comes back echoed from the target, they figure out the details of the distance, shape and speed of approach. Bottlenose dolphins have many predators in the marine world. Adult dolphins are apex predators but the young ones are often being preyed on. The bigger species in the shark family such as great white shark, dusky shark, tiger shark and bull shark hunt on the juvenile ones of these dolphins. Killer whales have been observed to hunt over these dolphins, rarely though. Bottlenose dolphins are well adapted to their marine life. Their habits and defensive efforts enable them to adapt themselves in water. Body shape of these dolphins is very energy competent for their swimming habit. It exerts less resistance while swimming ahead. 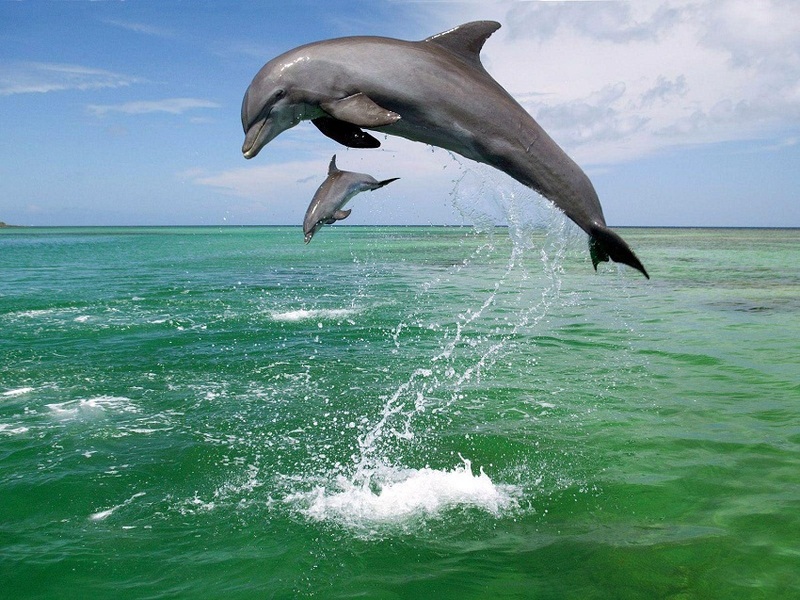 The flying up and thrusting forward swimming movement of the dolphins is called “porpoise”. This kind of movement saves more energy than swimming in water. Dolphins respire through a blowhole which is on top of their heads. Those blowholes are covered with watertight muscular flutter. These dolphins inhale while they jump over the water surface and hold the air within themselves while they are under water. They hold their breath for approximately 10 min to 12 min under water. 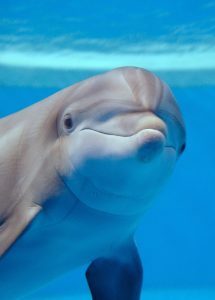 It takes only 0.3 second to complete a respiration cycle for the dolphins and thus they can hold their breath longer. The dolphins dive at depths of 10 ft to 150 fl under water. Though they are capable of diving even more depths and they do so depending on the availability of food in their habitat zone. They have slow heart rates during diving under water. 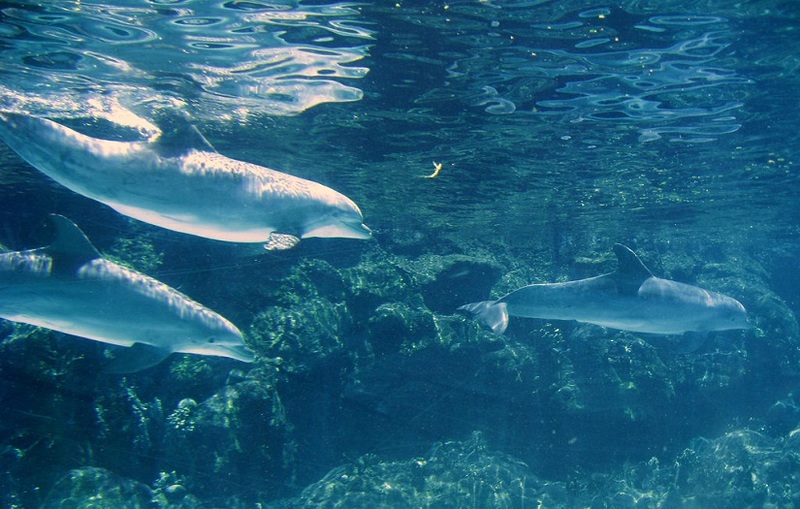 Part of their brain stays awake even while these dolphins sleep. They occasionally close their eyes. Thus they are not absolutely vulnerable while asleep. Bottlenose Dolphins mate and breed throughout the year. The peak mating and breeding comes in the warmer months. This peak season varies with their habitat. They mate for non-reproductive and only pleasure purpose also. Female dolphins of this genus attain reproductive maturity at the age between 5 years and 11 years, whereas the males mature between the ages of 9 years and 14 years. These dolphins are polygamous ones and mate with numerous suitors in each peak breeding season. Both the genders have their reproductive organs cover inside a slit in the underneath side of their bodies. They mate in a belly to belly position. The males compete among themselves over access to females. Every male drops a large amount of their own germ cells inside the females during the reproductive mating. The amount of germ cells washes away the lot of germ cells that was dropped by the previous male who mated. Gestation period is of about 12 months. Usually single calf is born at a time. Twins are born rare. The new born calves are raised by the mother dolphins. The calves stay with their mothers till about 6 years of age. Sometimes, the new mothers return to their mothers with the new born ones to raise them. The dolphin calves are about 2.5 to 4.5 m long and they weigh between 9 kg and 30 kg. The juveniles are nursed for the first time within 6 hrs from birth. Their lactation period lasts till about 20 months of age. Average of a healthy bottlenose dolphin is about 25 years, in the wild. This life span varies with the habitat zone while counted on the wild habitat and while it is a captive species in question then the span depends on the care taken of the dolphin. Bottlenose Dolphins are on top of ecological food chain. Only the juveniles are being preyed on in the marine world. See the diagram below. The genus of Bottlenose dolphins is not endangered. They are very adaptive to the dynamism of their habitat and ecology and thus they are supposedly safe in future. Only a few populations of these mammals are threatened in different parts of the world due to environmental problems. 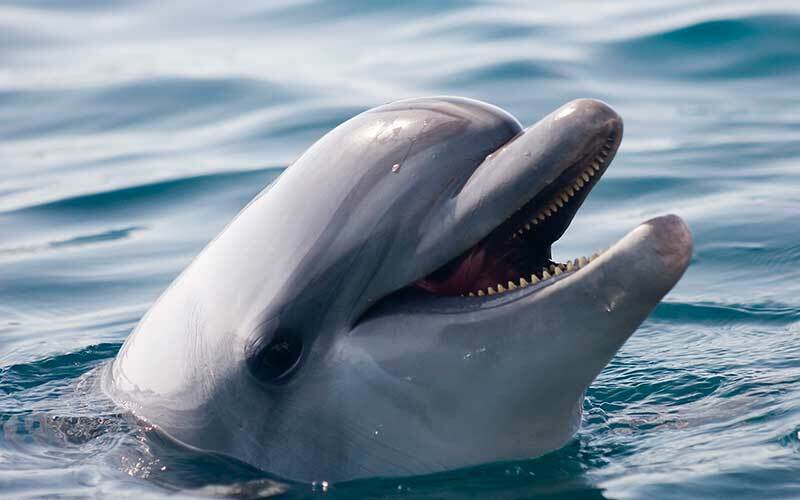 Read about some of the fun and interesting facts about these dolphins in here. Body temperature of these dolphins is approximately same of that of humans. The fountain of flush of water that we see on dolphin’s head is actually water vapor rising from the blowhole on top of its head. Water on the top of its blowhole flap and the water around it on the surface level splashes upward de the intolerance of the pressure that the flap exerts when it jumps on the surface of water and opens the blowhole flap to exhale stored air and inhale fresh air. They have a very sharp sense of hearing. 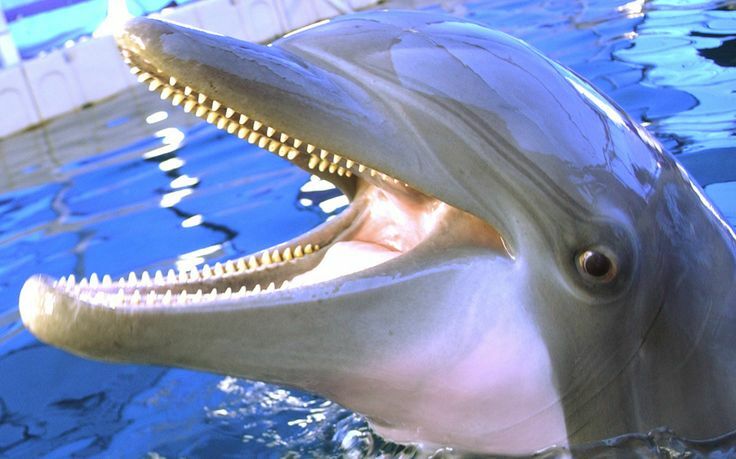 These dolphins have been tested and proven to be most intelligent of all the animals.